Coleman tent campers are considered as one of the mostly popular products in the recreational vehicle industry. So most people who enjoy traveling and camping, know that Coleman tent campers are very much worth considering. Tent campers made by Coleman come in various designs and sizes and each model has different features, which make camping life more comfortable and enjoyable. Standard features that can be found in these campers are beds, refrigerators, kitchen with sink, water pumps, water storage containers, storage cabinets, stoves, showers, and toilets. 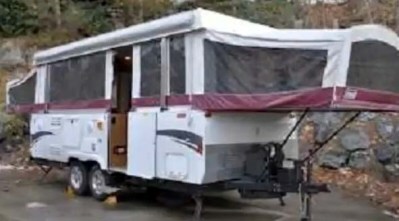 The price of the used Coleman tent campers ranges between $7,500 and $11,000 depending on the features included, the size of the camper and the current condition of the vehicle. Coleman tent campers are also known for their easily towing, they are lightweight yet providing enough space for sleeping. The most popular models of Coleman tent campers are The Highlander Series, The Evolution Series, The Americana Series, Niagara, Cheyenne, Westlake, Grand Tour. The Highlander Series will enable you to experience the luxury plus comfort and easy tow ability all in one camper. All models from Highlander Series features casual areas, AM/FM/CD stereo with iPod connections and cable TV connection. Also it offers galley type residential style, counter tops seamless edged, refrigerator, indoor stove 3-burner, sink, microwave oven, slide-out dinette, quilted mattresses, outside shower, air-conditioning, water heater. The Evolution Series are the most rugged of all Coleman tent campers. They are constructed to withstand the harshest terrain thanks to off-road capabilities. Yet they provide you all the comfort of home and many amenities that allow you to bring with you all the things you may need on the road. Each model from the Evolution Series is highly quality constructed with aluminum body and bed rails, powder coated steel body reinforcements. They come with features such as comfortable hypoallergenic mattresses, carry-out free standing dining table, full storage upper galley, two burner stove and many more. The Americana Series are the premier tent campers among Coleman tent campers. They offer increased storage and more headroom. Moreover, they are equipped with amenities and features that will give you full comfort while camping. They feature casual seating area, galley type swing level, refrigerator, indoor stove with 3 burners, sink and more. Nowadays tents are already obsolete. Lately most people want to have a more comfortable vacation, even if they go into the wilderness where there are no hotels or hostels, where they can feel they are in the middle of nature but still keep a piece of wilderness around without having to give up all the comfort. Coleman tent campers are surely the best you can find, used or new. They are pop up campers, which means that you can easily set them up, spend a few days or nights somewhere, and then just fold them and go. They are very efficient, comfortable and they have a lot of features. 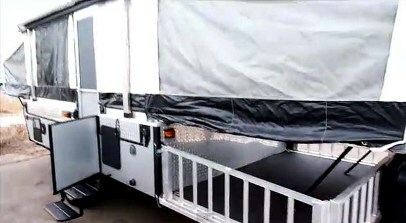 They are the best choice for various reasons: they are lightweight, which makes them so easy to be carried, unlike many tents and trailers that make driving much harder and distances longer. They are also small, but they offer a lot of space when they are set up. You won't have to worry about taking up too much space, but you can also be sure that you will feel comfortable inside during your vacation. All Coleman tent camper reviews are good, because everyone who ever tried them knows that these campers are great for many purposes and they are very comfortable.